In Part 1 of this article, we discussed the anatomy of finger pulleys, the biomechanics behind our flexor tendon/pulley system, and the implications these factors have on our climbing. In Part 2, I’d like to shed some light on pulley injury specifics, including the injury grading system and what tissues/structures are affected, and then I will walk you through what conservative management of a pulley injury looks like. The good news for climbers today is that climbing-specific surgeons, like Dr. Volker Schöffl, now view surgery as a last resort for single pulley injuries, and only recommend it for multiple pulley ruptures.1 I will finish with some injury prevention strategies to keep you all climbing strong and healthy. Read on to learn more! Let’s start by defining some terminology. Remember that our pulleys are ligaments. A sprain/strain describes a stretch or partial tear of a ligament (“strain” is usually reserved for injuries to a muscle or tendon, but some of the literature mentions a strain of the pulley). A pulley rupture is a complete tear of the ligament, where no part of the tissue remains in contact with the other side. Now that you have an understanding of the terminology, let’s discuss specifics. Grade IV – multiple ruptures as in A2/A3, A2/A3/A4, OR single rupture A2/A3 WITH trauma to the lumbrical muscles or other ligaments. The unfortunate and sobering part of injuring a pulley is that it is typically recommended that you take a break from climbing and allow time for your tissues to heal. Yes, that means limiting your climbing, but it can be a really good opportunity to focus your attention on other things. Being injured is never what we want, but often times it presents a beautiful moment to reflect and plan for the future. Whether it inspires you following the injury to start a training program or to train more intelligently moving forward, or maybe to completely spend time and energy on other parts of your life, injuries can be good teaching moments in our lives. If you’re currently dealing with an injury and looking for some strategies to handle the down time, feel free to reach out to me (mattdestefanopt@gmail.com). I’m happy to help. The most important part of rehabbing these injuries is to respect the injury, take the timelines seriously, and listen to your body. Everyone will have a different experience, but don’t do too much too soon, or you may set yourself back and have to start all over. Be sure to read the Rehab Protocol in the Treatment Section below for more detailed guidance. Below I have explained the general timelines, and included graphic representations of the timelines courtesy of Will Anglin. 6 weeks is the recommended time to return to FULL climbing activities, but you’ll work your way up to that. No immobilization is necessary, and passive range of motion (ROM) exercises should be performed. You’ll want to protect the injury using tape (H-taping; taping technique described briefly below and in depth in a future article) and perform functional exercises at about the 2-4 week mark. After 4 weeks, you can start easy climbing to regain strength, coordination and body awareness, but don’t push it. At 6 weeks you can begin full climbing to regain full ability. You can wear tape for up to 3 months once you return back to climbing. 6-8 weeks is the recommended time to return to FULL climbing activities, but again you’ll work your way up to that. Immobilization is necessary this time to protect the injured tissue, and 10 days is indicated. Passive ROM exercises after immobilization phase. You’ll again want to protect the injury using tape and perform functional exercises starting at the 2-4 week mark. After 4 weeks, you can start easy climbing to regain strength, coordination and body awareness. At 6-8 weeks you can begin full climbing to regain full ability. You should wear tape for up to 3 months once climbing again. 3 months are recommended for a return to FULL climbing activities due to the biomechanical implications of an A2/A3 pulley rupture. Immobilization for 10-14 days is necessary to protect the pulley and after the immobilization/splinting process, you will use a thermoplastic pulley ring provided by a doctor instead of tape (more on the ring later). Passive ROM exercises following immobilization. Functional exercises will begin at the full 4 week mark, and EASY climbing will commence after a 6-8 week period from injury onset. At 3 months you can begin full climbing activities, and you’ll wear the pulley ring (or tape) for roughly 6 months after climbing begins again. A full 6 months are required to return to FULL climbing due to the surgical implications necessary to treat a Grade IV pulley injury. Immobilization lasts for 14 days post operation. 4 weeks are required before initiation of functional exercises, but passive ROM exercises are suggested leading up to this point. A pulley ring will be utilized throughout this process. EASY climbing will have to wait a full 4 months and FULL climbing activities won’t start until roughly 6 months post surgery. The taping/pulley ring timeline may last for over a year post surgery. In the graphics he mentions supportive taping throughout the whole process, but I want to remind you the importance of using an actual Pulley Ring. Taping will help, but it will not be as rigid and supportive as a thermoplastic ring. If you have a Grade II-IV pulley injury, please seek out a clinician who can fit you with a pulley ring. During the “functional exercise” phase, it is highly recommended that you work alongside a physical therapist or other healthcare professional to ensure that you’re loading the tissues properly and not over doing it. Remember that everyone will have a unique timeline of their own, influenced by genetics, diet, stress, activity level etc., so guidance from a PT is very valuable. Make sure you check out the rehab protocol described below! In the representation of Grade IV recovery, you will notice a large gap from week 6 to 4 months. During this period, physical therapy and functional exercises should continue. Movement is key to your success, but only by following the guidelines expressed in this article or provided by your PT or surgeon. *Taken from their book titled, Hand and Finger Injuries in Rock Climbers. **In the timelines, you’ll see a percentage of “RL” listed. This is the percentage of your redpoint level (RL). You really should seek specialized medical attention if you think you may have injured a pulley, especially if you suspect a full rupture. Now that you have an idea regarding the typical timelines of these injuries, let’s dig deeper into the actual treatment strategies and interventions for pulley injuries. Contrary to popular belief, only a Grade IV Pulley injury (multiple pulley ruptures) requires surgical repair. According to Dr. Schöffl and other clinicians, Grades I-III are now successfully managed with conservative care.2,3 What does this mean for you? It means you may not need surgery. Any chance to avoid surgery is beneficial. Some of the inherent risks following surgery include neurovascular impairment, infection, scar formation, graft failure (surgical revision necessary), synovitis (inflamed joints), stiffness, and tendon impingement.3,5 By avoiding these risks, and surgery in general, your chances of returning to climbing sooner are enhanced. Read on to see what conservative treatment looks like. In a Grade IV pulley injury, there is extensive disruption to the finger flexor/pulley system, usually in the form of bowstringing that alters the mechanics of the finger to such an extent that surgery is required to reinstate the normal biomechanics. In Grades I-III, the system is only biomechanically altered to a minor degree, and that is why we can proceed without surgical intervention. But, even in Grade I-III injuries, the tendon does initially move away from the normal tracking close to the bone. The Schneeberger and Schweizer study3 showed that with conservative, non-surgical treatment, all injured fingers in the study regained the proper tendon tracking close to the bone, and reduced the tendon to bone distance by statistically significant amounts. This returned the fingers to ideal biomechanics and was achieved after an average 67 days post injury. The single most important aspect to conservative management of an acute pulley injury (and post surgery) is to protect the pulley so that it can heal properly. Dr. Schöffl and Dr. Schweizer have both reported extensively in the literature on the importance and utility of using a pulley ring (thermoplastic ring) to protect the pulley during a course of rehabilitation.3,6 Unlike circumferential taping of the finger/pulley, a pulley ring is rigid and will not stretch as tape would. In addition, the pulley ring is placed over the distal portion of the proximal phalanx unlike H-taping described later. Below is an image of the pulley ring used in the Schneeberger study. You’ll notice concavities on the sides of the ring. This is to protect the nerves, arteries, and veins in your finger from being compressed (tape does not discriminate where it applies force, and neurovasculature may be impaired by taping). This protective method (ring/tape) is utilized both during and after the rehabilitation process to allow the pulley to heal with minimal stress to the tissue. Dr. Schöffl made a post on his Instagram about custom colored pulley rings. So yea, it’s a thing. Check it out here. That’s essentially it. Rehab time is the main difference between the traditional method of surgically repairing ALL pulley injuries and now conservatively managing Grades I-III with the intentional use of a pulley ring. (Also, without surgery you have more freedom to use your finger earlier, but guidelines are still in place.) The literature shows that outcomes are excellent with conservative management, and most climbers return to their prior level of climbing.3 Remembering the timelines introduced above, this means that unless you have a major Grade IV injury and surgery, your rehab time should be shorter than a surgery rehab. If they treated ALL pulley injuries with surgery that would mean that any injury to the pulley would keep you from climbing for at least 6 months (and without actively using your finger for at least 45 days). Thanks to the diligent research endeavors by the names above, we now have the evidence and clinical expertise to get you back to climbing sooner. Use broad tape initially so you can pull the strips in half, creating the “H” or “X”. Don’t pull the tape directly from the roll onto the finger. Tear the tape off first. Apply central pressure directly over the A3 pulley (PIP joint). Slightly flex the PIP to about 60˚ when placing the tape. This allows for better tendon-bone approximation. Tighten distal strips first, then proximal strips. Cover your work with skinny tape at the end to avoid the tape unraveling. Throughout this article, the research authors and I have mentioned “functional therapy” or “functional exercise,” but what does that mean? This is termed to describe rehabilitation exercises that restore function to the injured area, structured in a way to effectively return you to optimal performance. When we rehabilitate an injury, we need to respect the proper healing times and we need the exercise progression to apply a therapeutic stress to the healing tissues. I have some helpful tips and exercises for you here, but I do highly recommend seeking the guidance of a physical therapist or another healthcare professional to help guide you through your process. So what do each of these mean? Starting from the bottom of the pyramid, you’ll initially want to unload the affected tissue, then regain mobility in and around the injured tissue, and finally strengthen the tissue with a follow up level to utilize movement strategies to change your old movement patterns and create newer, healthier ones to avoid injury in the future. When performing functional exercises during the Rock Rehab Protocol, there will be multiple levels of each layer in the pyramid. In other words, there will be 3 unloading exercises/techniques, 3 mobility techniques, etc. Dr. Vagy goes into full detail in his new book titled Climb Injury-Free, but below is a little snapshot of things to do for pulley injuries. 2. Mobility – Tendon Glides: Perform 3 sets of 10 reps, 2-3 times per day. 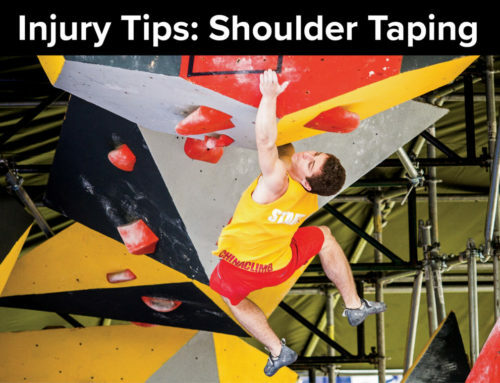 Variation: Think about doing these tendon glides in a more climbing-specific posture. 3. Strengthening – Rubber Band Finger Extensions (to strengthen the antagonist muscles and reduce the pressure on the healing pulley): Perform 3 sets of 15 reps with 5 second isometric holds; once per day. A. Instead of pulling hard from small edges, remember to push with your feet too. B. Instead of making dynamic moves from small edges, try to move more statically. Remember from Part 1, that when we move dynamically off of a crimp, the force on the pulley increases 62%! So try to move through small edges statically when you can. Obviously there is no way you can avoid dynamic moves from crimps forever, especially if you climb higher grades, but only do it when necessary. C. Instead of using a full crimp all the time, limit its use, and utilize a half crimp or open hand posture more frequently. To learn more about Dr. Vagy’s protocols and his Rock Rehab Pyramid, check out this link to his book titled Climb Injury-Free. Doctor of Physical Therapy, Esther Smith, of Grassroots Physical Therapy in Salt Lake City has created an amazingly comprehensive protocol for treating pulley injuries. As the physical therapist for the Black Diamond pro climbing team, Dr. Smith has put together an article for you to view on the Black Diamond website, so be sure to go check it out here! Anyone with a finger injury may look at a hangboard and cringe, but Dr. Smith explains how the hangboard can be used as a tool to help heal fingers in the later stages of injury. I strongly encourage you to go read the article. Below is my synopsis of the protocol. ***As a general rule, unless your finger is bowstringing (Grade IV injury) then you can utilize this protocol. Be honest with the timeline. If your injury is less than 6 weeks old, make sure you abide by Phase 1. Go seek a PT or other medical professional if you injure your finger. Dr. Smith has specifically made the distinction between the two phases of the pulley injury with Phase 1 being the early acute phase, and Phase 2 being the later remodeling phase. Injury onset up to 6 weeks puts you in the acute phase, and anything over 6 weeks is considered the remodeling phase. The reason for the distinction is related to the nature of tissue healing. In the early days/weeks after a sprain injury, the ligament is regenerating in a more gross fashion with less specificity or organization. During this time period, the healing tissue is lacking strength and it is imperative that you do not overload it. Moving forward into the later stage of tissue remodeling, the tissue is gaining strength and must be loaded appropriately to ensure the collagen fibers achieve proper orientation and the ligament regains optimal strength. Phase 2 can also be utilized by someone with a long lasting finger injury that never quite healed properly and still gives you pain/discomfort. So long as you’re more than 6 weeks post injury and you don’t have any range of motion limitations, feel free to jump right into Phase 2. Read on for more in-depth guidance on how to proceed. As mentioned above, this phase will focus on newer injuries and help to regain baseline range of motion, reduce swelling, and allow the initial injury to heal appropriately before engaging in finger loading of phase 2. Watch this YouTube video of Esther Smith running Dan Mirsky through some exercises used for finger pulley injuries. These exercises are good options to initially get the finger moving without loading it to excess and to ensure that the finger doesn’t lose range of motion. They should also be used periodically to take inventory of the healing tissue and to gauge where you’re at in the process. You don’t want to develop scar tissue, so these help to increase blood flow, limit the inflammation, and move swelling out of the injured area to allow for optimal healing. If newly injured, stay away from that raw, painful zone and work around it, remembering to get all the way down into the palm of the hand. These movements get the tendon gliding through the pulley surrounding it, and help to avoid adhesions and scar tissue in the finger. They should be done without loading the fingers, but only moving through the full range of motion. These are also a great warm-up for the tissue even when uninjured. While you’re walking to the crag, warming up generally, or just staring down a climb, you can do these to keep the tissue moving smoothly. These movements are an advanced version of the tendon glides, and incorporate a more active, controlled range of motion. But again the fingers are not loaded. You’ll notice that your non-dominant hand may be more difficult to perform the pen rolls, so make sure to practice! Balance is one of the most important aspects of healthy climbing practices. These movements are used as you become more comfortable moving your finger. Again, they are movements that do not directly load the injured pulley. They allow the finger to move in its full range of motion and to strengthen the muscles and joints that support the finger flexors. Precaution: Gently and smoothly stab into the rice to avoid pain. Progress to more robust movement as tolerated. With some therapy putty, spread your fingers apart into extension to work the finger flexor antagonists. This will build a good foundational strength to support the rehab process moving forward. Gentle towel gathering is a good way to get the finger flexors working without placing too much stress on the tissue early on. Remember to keep a neutral wrist when doing this exercise. Make sure you’ve achieved full range of motion in the affect finger joints before beginning the next phase. If you still haven’t regained full range of motion by 6 weeks, seek qualified care to check for underlying issues. Ensure that you no longer have pain with normal everyday movements. Direct pressure to the area may still be tender, but it shouldn’t hurt with basic movements. If both of these precautions have been addressed, try starting the “Load Testing” part of Phase 2. Read on to learn about the next steps. Phase 2 of the rehabilitation is designed to remodel the healing tissue in a structured manner to allow for optimal functioning of the tissue. When tendon and ligamentous tissue heals without a directed load, it lays down a matrix that is disorganized and irregular. When a directed load is applied to the healing tissue, that matrix is reorganized into a structured form that follows the load direction. To visualize the concept, think of this analogy. Imagine you have a bunch of individual strands of string and you’re holding the ends of every string in each hand. Without pulling your hands apart, the strings are bunched up and there is no order to the strings. Now if you pull your hands apart, every string becomes straight and taut, and there is an ordered matrix of consistent fibers. This is what we want for our healing tendons and ligaments. For optimal strength and performance of the tissue, there needs to be an ordered matrix, and to do that we need to apply a therapeutic load while our tissue heals. This is where Phase 2, The Remodeling Phase, comes in. Giving your healing process an agenda will allow you to optimize your recovery and get you back to sending your projects! Let’s take a look at the first part of the protocol, a process that Dr. Smith calls “Load Testing”. After warming up with some movements described in Phase 1, find a two-finger pocket deep enough for about two pads. (If the two-finger pocket grip doesn’t produce your familiar pain, maybe try using another grip type, or even a pinch grip. Everyone will have a different response to the process, so find what talks to you, and go from there. Some people may need to use all type of grips, so run yourself through the protocol with each grip type.) You will hang from the injured finger plus one adjacent finger, usually the ring and middle fingers. (Check out my other article explaining how to hang safely from pockets.) Start by slowly and gently hanging at body weight and see what it feels like. If at first you’re hanging at body weight and sense there’s no way you can grip without intense pain, then offload your body weight using pulleys. (Click here to watch a brief video clip of Mark Anderson demonstrating a hangboard pulley system.) Offload weight until you feel a MILD, familiar discomfort that reproduces your pain a little bit. Hang on the hangboard in this position for 10 seconds, for 3 reps, with 2-3 minutes in between each rep. The reason for the pain is that you need to know you’re actually stressing the correct tissue and creating the micro inflammatory response mentioned above to remodel the collagen fibers. The only way to break up the old, irregularly structured collagen fibers and lay down new, regularly structured collagen fibers is through this micro inflammatory response followed by a therapeutic load. Dr. Smith brings up a very good point that “hurt does not equal harm”, and that the low grade pain indicates that you’re using the proper load. The proper amount of load will produce low-grade symptoms (she says a “strain or slight pain” during the hang.) Make sure that any discomfort/symptoms do not last longer than 10 minutes post-hang. If they do, you need to offload more weight. Another consideration Dr. Smith makes is to make sure that the symptoms you feel are not caused by direct pressure from a hold, but from the actual tissue loading from the hang. Holding a jug might hurt because of the hold pressing against the injured tissue, and not because of the actual tissue being loaded. Also, if a two-finger pocket does not produce your familiar discomfort, you may need to find a hold that does, say a pinch grip, and run through the Load Test and Remodeling phase with this instead. Load Test Recap: Complete this process before beginning the actual remodeling phase to determine what the necessary load is for your finger. Warm up with some movements from Phase 1. Find a two-finger pocket on the hangboard deep enough for about 2 pads. Find a load that reproduces a mild form of your discomfort (strain or slight pain). You might have to offload weight using a pulley system. Perform 3, 10-second hangs with 2-3 minutes rest in between reps.
Make sure that the hang doesn’t produce symptoms that last any longer than 10 minutes post-hang. If you can do this successfully, use this load for your remodeling phase. Now that you’ve done the Load Test, you’ll begin the actual protocol using this load/weight. Make sure that you are not fatigued when starting the remodeling hangs, as you need to be fresh to obtain maximum benefit and avoid further injury. Using your newly found hanging weight, do 3-5 hangs for 10 seconds each, resting for 2-3 minutes in between each hang. Dr. Smith recommends doing your rehab and stretches in between hangs (dynamic stretches, no static holds.) She says to think, “actively mobilizing the tissue”. You can be doing tendon glides, pen rolling, or rice bucket in between sets. Repeat this process 1-3 times per week, spreading your sessions out. Don’t do too much too soon and make sure you warm up first. Progress this process over the course of 6-8 weeks, to continually apply the therapeutic load and orient the tissue in a structured manner, making the tendon stronger over time. Over the 6-8 weeks, return to the hangboard after 2 sessions or so (1 week) and reassess. If this load no longer produces your symptoms, add 2.5-5 lbs. This might mean removing 2.5-5 lb. of weight from the pulley weights or adding 2.5-5 lb. to your body weight (attached to a harness). Keep hanging with this new load until you no longer feel the familiar pain, and then you do it all over again, removing/adding 2.5-5 lbs. each time you reassess. After about 2-3 weeks of successfully hanging with 15 lbs. above body weight in two-finger pockets, start experimenting with crimps. Once you begin experimenting with crimps, start the whole process over again, doing a new Load Test with a crimp, and finding your baseline familiar pain threshold. Begin with your Load Test amount and eventually start adding weight by 2.5-5 lb. increments (just as you did before), for several weeks until this hold no longer produces pain. Remodeling Protocol Recap: Begin the following procedure after you have found a tolerant hanging load that mildly reproduces your symptoms (strain or slight pain) and does not result in lasting symptoms. Warm up first with Phase 1 exercises. **NOTE: Do not do any strenuous exercise (i.e. strenuous climbing) before or after your hangboard session to ensure that you are not fatigued. Find a two-finger pocket on the hangboard. Do 3-5 hangs for 10-seconds each, resting 2-3 minute in between each hang. You can do your rehab exercises while resting in between each hang. Repeat the process 1-3 times per week, spacing out each session. After 2 sessions or 1 week, reassess your hangs. If the current load no longer produces symptoms, add weight (or eliminate from pulley assistance) by 2.5-5 lbs. Continue hanging with the new load until THIS no longer produces symptoms. Repeat this cyclical process until you are able to hang on the hangboard with 15-30 lbs. above body weight over the course of 6-8 weeks. After you are able to successfully hang with 15 lbs above body weight, you can begin testing other holds like crimps. No stiffness or motion loss ensues. Once you are able to climb/train with no residual symptoms, and/or you have achieved the two-finger pocket hangs with 20-30 lbs. over body weight with no symptoms, you’ve successfully reached your goal! Author’s note: for many of you, this may be the first time to engage in a training program. Not only have you healed your tissue, but also you’ve successfully completed a rigorous hangboard training program that will set you up for increased climbing performance moving forward! Now go reap the benefits of all your hard work with enhanced grip strength. Can I Climb During The Process? It is strongly advised that you do not engage in climbing until you have first regained full range of motion in each knuckle/joint and that you have initiated the Load Testing phase. If you do begin climbing, make sure you protect the pulley through the use of a pulley ring or by H-taping the finger. As described earlier in the article, a pulley ring will offer the most protection. After you have initiated the Load Testing, start playing around on jugs but be careful. Jugs are the hold of choice because it puts limited biomechanical stress on the pulley, but it’s not ideal because it puts direct pressure on the pulley itself, which can be painful in its own right. Do an assessment on yourself by playing around on the wall. Do an easy, short, juggy traverse and see how it feels. Be honest with yourself and don’t push it. If that feels OK, then try to climb an easy, juggy route well below your previous climbing ability level. When you come down, assess your finger by doing your finger glides, etc. Do you have lasting pain after the route? Does your finger now have swelling? Check after each climb to take inventory. If you’re not able to climb pain-free or if you’re finger swelled up then stop climbing, or at least change the holds or the grade you’re playing around on. Listen to your body; you’ll know when something doesn’t feel right. Don’t cheat yourself. If you’re not able to climb without producing symptoms, then wait another week. You owe it to yourself to do things right. During the rehab process, you are progressing yourself along the way by ramping up your climbing abilities but staying away from the holds upon which you have not yet tested the hangboard protocol. Your climbing should gradually improve until it matches your hanging tolerance during the protocol. If you haven’t tried the remodeling phase with a crimp, then don’t climb a route with a crimp. Don’t exceed what you’ve done on the hangboard by climbing at a higher level on the wall. Be patient. You only climb on holds that you are currently using for the protocol. Don’t mask what you’re feeling by excessively taking Ibuprofen (Ibuprofen is used so liberally these days that it has jokingly been called “Vitamin I”.) Feel what’s happening. Ibuprofen isn’t good in a chronic situation because it’s snuffing the inflammation when that’s what you want. You want a little bit to create that micro inflammatory response. Get full range of motion back before beginning the protocol. Mobility first. Be careful and controlled when you’re testing it. Test it once, wait about 5-10 minutes and see how you respond to it. Don’t jump in headfirst. People are probably more likely to jump into climbing more readily than they would try the loading procedure on a hangboard. Don’t be one of those people. The hangboard is a tool! Hang right. Check out Dr. Smith’s “Hang Right” Articles here: Part 1 and Part 2. Be delicate and detailed with your protocol and training. Take the time during rehab to be deliberate and stop and take inventory throughout the process. Be careful with the progression toward climbing, because when we’re pumped and adrenaline is pumping, we tend to revert to old patterns and behaviors. This is when we’re vulnerable to not paying attention and making things worse. Remember: There’s no rush! Do it right the first time. Nutrition: turmeric, black cherry, holy basil, staying hydrated, Omega 3’s and 6’s, Bone broth, and other things that will help with tissue regeneration. If your finger is not any better in 14 days, and certainly not able to be loaded, go seek attention. Climb with hips into the wall to avoid over-gripping. Focus upstream at forearm muscle imbalances, shoulder mobility, and thoracic mobility. Start a hangboard routine today to get ahead of the curve. Here’s a helpful video by Eric Hörst of TrainingforClimbing.com. NOTE: Coach Hörst does not demonstrate offloading your weight using pulleys, but remember that it is a perfectly good option to do so when starting out. Now you have the information necessary to understand your pulley injury, how to identify it, what to do initially, and how to make sure you get back to climbing strong again. The hangboard is your friend later on in the rehab process, and can be used as a preventative measure as well. Remember to listen to your body throughout the process and you should be back to climbing strong when you are through. Happy climbing. Matt is Doctor of Physical Therapy who recently graduated from the University of Colorado’s Anschutz Medical Campus. While going to school, he lived in Boulder, CO to be closer to his playground. In his final semester of the DPT program he conducted an independent study researching climbing injuries and injury prevention techniques to provide to his clients. His main interests are in sports medicine physical therapy and injury prevention revolving around the climbing athlete. Before starting school, Matt lived in San Diego, CA and worked at Mesa Rim Climbing and Fitness. He plans to one day return to San Diego and work alongside Mesa Rim to give back to the community he loves. Schoffl VR, EINWAG F, STRECKER W, Schoffl I. Strength Measurement and Clinical Outcome after Pulley Ruptures in Climbers. Med Sci Sport Exerc. 2006;38(4):637-643. doi:10.1249/01.mss.0000210199.87328.6a. Schneeberger M, Schweizer A. Pulley Ruptures in Rock Climbers: Outcome of Conservative Treatment With the Pulley-Protection Splint-A Series of 47 Cases. Wilderness Environ Med. 2016;27(2):211-218. doi:10.1016/j.wem.2015.12.017. Gnecchi S, Moutet F. Hand and Finger Injuries in Rock Climbers. Cham: Springer International Publishing; 2015. doi:10.1007/978-3-319-16790-9. Zafonte B, Rendulic D, Szabo RM. Flexor Pulley System: Anatomy, Injury, and Management CME INFORMATION AND DISCLOSURES. J Hand Surg Am. 2014;39:2525-2532. doi:10.1016/j.jhsa.2014.06.005. Hochholzer T, Schoeffl V, Zapf J. One Move Too Many — : How to Understand the Injuries and Overuse Syndroms of Rock Climbing. Lochner; 2003. Schoffl I, Einwag F, Strecker W, Hennig F, Schoffl V. Impact of taping after finger flexor tendon pulley ruptures in rock climbers. J Appl Biomech. 2007;23(1):52-62. Thank you for all of your efforts putting this together. Saving this page for later! Thank you people for right down this! So much useful articles and materials. I’m with a pulley injure myself and this article will help me a lot! Bone broth.. loved the article untill then. I’m sorry that this turned you off, but remember that this is someone else’s advice not necessarily mine. With that said, everyone is going to have different responses to different nutritional supplements, and for a lot of people, bone broth proves very beneficial. The main idea is to try different things for your body, and experiment with what will give you the best results. Thank you very much. I hope to continue producing more articles into the future to help people with any issues they may have.